What I’d like to do here is see if we can get a bit of a discussion going on the topic of Sicily from both the Allied and Axis perspective. Myself, I find Sicily and what to do about it a fascinating topic and I hope some of you do too. First of all, I think we should in general look at this from the perspective of the Rules As Written, the RAW. Most of us use House Rules to a lesser or greater extent, but to make the discussion germane for all, I’m going to assume the RAW w/ all applicable errata, so that everyone is on the same page. The most important errata concerning Sicily is the change to the Straits of Messina concerning the Rail Ferries there, i.e. that these two hexsides are treated as narrow straits during initial, movement and exploitation phases thus eliminating the need for the Axis LC to act as a ferry here. [As an aside, one House Rule I DO recommend is to dispense with this Axis redeployment ability completely. While it would be needed if the Allies moved first in the game, it hardly seems needed with the Axis moving first, in that the Axis get to move, normally, in response to Allied intentions before the Allies can move at all. What I intend to do is to look at Sicily in terms of its value to each side and the difficulties associated with The Axis holding it and the Allies taking it. As with any Europa game, there are a great many variables that effect these considerations and I won’t be dealing with every possible variable, but I hope to address the most important ones. 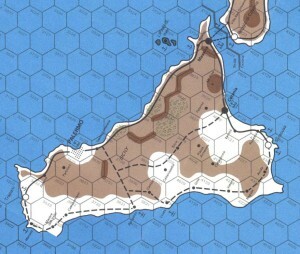 An Europa-map of the island of Sicily, assembled from maps 26 and 27 from Second Front.